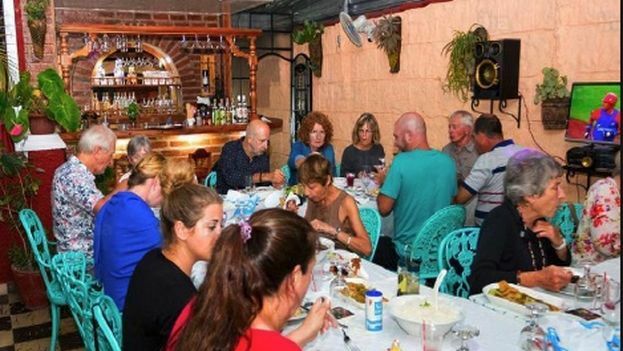 EFE, via 14ymedio, Havana, February 11, 2019 — Cuba recorded a total of 580,828 self-employed workers at the end of 2018, of which 29% are young people, 34% are women, and some 10% retirees who have joined the private sector, according to statistics published this Sunday by state-controlled media on the island. The provinces of Havana, Matanzas, Villa Clara, Camagüey, Holguín, and Santiago de Cuba contain 65% of the private or self-employed workers in the country, according to the statement of the first vice minister of work and social security, Marta Elena Feitó, in an interview with the newspaper Juventud Rebelde. The activities most represented are still those related to food (9%), transport of cargo and passengers (8%), renting of homes, rooms, and spaces (6%), telecommunications agents (5), and contracted workers (26%), employees in the areas of food and transport, specified the vice minister. Feitó noted that the principal changes in the issuing of licenses applied since December 7 eliminated the capacity cap of 50 seats for service in a restaurant, bar, or cafe, and license holders are now allowed to establish more than one activity of this type in the same home, and even the possibility of selling non-alcoholic drinks in bakeries was included. The announcement of the new rules regulating private work — which in theory had been expected to restrict to only one the number of licenses and limit the capacity for private restaurants and sparked discontent among its targets — was, in the end, settled with a reworking of those measures. The last inventory made of the exercise of private work after the set of new rules went into effect found that 15,466 people do more than one activity, especially in the food sector. In that sense, she mentioned that at the close of last December, 793 measures were enforced for breaches of the current legislation and specified that of that number, 610 were preventative notifications and 183 were fines, 18% of these for performing labor activities in an illegal manner. The director emphasized that there are still people exercising activities in an illegal manner, in the majority of cases on public roads and on the outskirts of state-controlled bodies, and expressed the opinion that those “cannot face an inspection body alone” but rather it must be done in a “comprehensive” manner. She stressed that it’s necessary to preserve this form of non-state management in a “framework of legality” because she recognized that it is an “important” type of employment that increases the supply of goods and services, frees the state of non-fundamental activities, and the taxes that are collected by that route are a source of income for local budgets. In Cuba, with a total population of some 11.2 million inhabitants, self-employed people now represent 13% of the population, almost quadruple those recorded in 2010 when the island’s government increased private activity in a number of sectors and freelance workers surpassed 150,000.